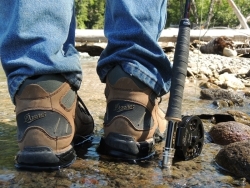 I started wearing my Danner 453s in 2013 when I started working on the Fishing Mount Hood Country book with co-author Robert Campbell. First trip was to the East Fork Hood River with one of my pro-staffers, Tommy Brown. We jumped from log to log and waded across gravel bars to float dry flies in the riffles. Mostly we caught cutthroats . . . but I digress. This is about boots. Since that first break-in run, I've worn these boots everywhere I've been: South Dakota for pheasants, South Africa for plains game, southeast Alaska for silver salmon. My last trip was to northern Minnesota for a black bear hunt. 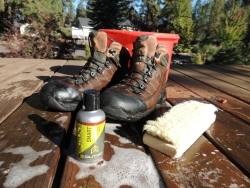 I spent a few minutes de-scenting the boots for the days in the blind and it was the second day when all the preparations paid off. These boots, after more than two years of punishment, have held up well. I can go into three inches of water without getting wet. This GORE-TEX liner works. I really like the scuff-proof toe cap, it, I think, is the key to keeping the boot together after a lot of abuse. The leather upper still looks good after I brush the blood and dirt out. I'm starting to wear down the treads, but I have a few miles left in my 453s.